Treacherous times for local Flying Foxes – Northern Rivers Wildlife Carers Inc. This two-week old Black Flying Fox was found alone in a tree after its mother died during her nightly flight. 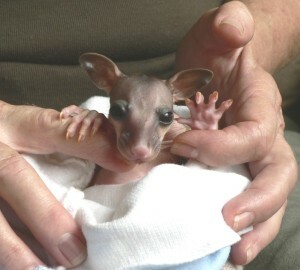 It was rescued by the Northern Rivers Wildlife Carers. It’s hard to ignore that local Flying Foxes have been having a tough time lately. Last month heat wave conditions killed thousands of Flying Foxes at Casino, leaving hundreds of young orphaned. The high temperatures experienced so early in the Flying Foxes breeding season, meant that many females were nursing very young babies when they died. The emergency response has kept carers from Northern Rivers Wildlife Carers, WIRES and surrounding organisations very busy as the orphans were placed with carers, including some from inter-state, who could help hand raise them. Apart from the heat event, Flying Foxes right across the region continue to face danger on a daily basis. Every night when adults leave their day time roost in search of food, they navigate around numerous hazards like electricity wires which can electrocute them, barbed wire or orchard netting in which they can become entangled or motor vehicles which they can on occasion collide with. At this time of year, female Flying Foxes carry their young with them on their nightly flight. If the mother dies whilst out feeding, often the young survive protected by their mother. But without her they cannot return to their day time roost or survive on their own. These young are left stranded and alone. And that’s what happened to a young Black Flying Fox, found hanging very high in a tree in Cherry St, Ballina. A concerned member of the public called the Northern Rivers Wildlife Carers rescue hotline after hearing the baby calling all night and a trained and vaccinated carer was promptly sent out to help. When the carer arrived, the young animal was found high up in the tree, out of reach. After some quick thinking, the carer approached nearby Betta Hire to see if they would be willing to help retrieve the orphan. Betta Hire kindly obliged, and sent around a cherry picker, in which the vaccinated carer could safely rescue the young animal. Estimated to be only two weeks old, the young Flying Fox was unable to survive on its own, and its timely rescue ultimately saved its life. 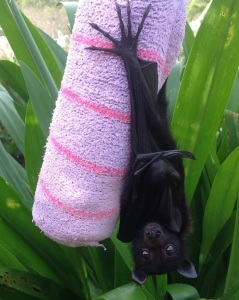 The young Flying Fox has settled into care well, and will be hand raised until it is old enough to return to the wild. The Northern Rivers Wildlife Carers extends its gratitude to Betta Hire for its assistance and asks people to report any Flying Fox that is found alone to their rescue hotline.